Pictured is Anne’s Grandmother. 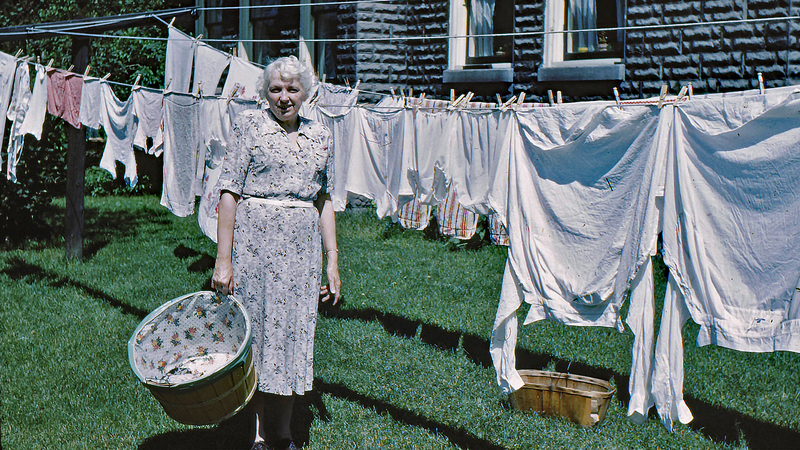 In the fifties, Bubs took this photo of her mom. Today, we did our own monumental wash, but I suspect that for Margaret, this was her normal wash day. With the modern convenience of a coin operated washeteria, we can probably push more cotton through the wash, rinse, repeat and then dry cycle than she could. I certainly hope so, because we had a lot of laundry to do. Such is cabin living, both a combination of rustic and modern. I met Margaret once, I was picking Anne up for a date in high school and as always, I came into the living room to see the family first. Bubs and Margaret were sitting on the couch together and Bubs and I conversed, while we waited for Anne to get ready. Long afterwards, I learned of Margaret’s approval of me. Her summary was, “She seemed like a nice girl.” In her defense, I did have long hair back then and I was nice with her. What’s a little gender-bending after all?